Join us for a reading group discussion of The Persian Boy by Mary Renault! Mary Renault received a degree in English from Oxford University in 1928. In 1933 she began training as a nurse at the Radcliffe Infirmary in Oxford. During her training, she met Julie Mullard, a fellow nurse, with whom she established a lifelong romantic relationship. Mary worked as a nurse while beginning a writing career, publishing her first novel, Purposes of Love, in 1939. Her historical novels, set in ancient Greece, were popular throughout the English-speaking world. 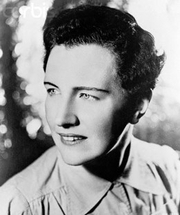 In 1948, after her novel Return to Night won a prize worth $150,000, Renault and Mullard emigrated to South Africa, where they lived together for the rest of their lives. They were critical of apartheid and participated in the Black Sash movement in the 1950s. Mary Renault is currently considered a "single author." If one or more works are by a distinct, homonymous authors, go ahead and split the author. Mary Renault is composed of 15 names. You can examine and separate out names.